step-1: you compare the first item with the second. If the first item is bigger than the second item. you swap them so that the bigger one stays in the second position. step-2:And then compare second with third item. if second item is bigger than the third, we swap them. otherwise, they stayed in their position. Hence, the biggest among first three is in the third position. step-3:we keep doing it. until we hit the last element of the array. In that way we bubble up the biggest item of the array to the right most position of the array. step-4: Look at the inner loop in the code below. step-5: We repeat this process, starting from the last item of the array. look at the outer loop in the code below. We do this way, so that after finishing the first inner loop, the biggest one will be in the last item of the array. step-6: and then we move backward inside the outer loop. how does it works: This is very simple. Go through the array, find the index of the lowest element swap the lowest element with the first element. Hence first element is the lowest element in the array. Now go through the rest of the array (excluding the first element) and find the index of the lowest and swap it with the second element. thats how it continues to select (find out) the lowest element of the array and putting it on the left until it hits the last element. step-1: If the first card you are getting is 5. Just hold the card in your hand. you dont have to do anything. step-2: If the second card is 2, you want to put it before 5 so that the two cards you have are sorted. When you are putting the card with number 2 at the left, you are changing the position of the card 5 from first position to second position. And then first position becomes available and you put 2 there. step-3: If the third card is 4. you will start from second position. In the second position, you have card 5 which is bigger than 4. Hence you will move 5 to the third position. The next card to the left is 2 which is smaller than 4. Hence, you wont move 2. And you will insert card 4 in the second position. step-4: Then you got 10. It is bigger than the previous card which is 5. Hence, you just add it at the last position. step-5: The next card is 7. You just move the position of the card 10 to the right and insert card 7.
step-6: If the last card is 3. You will have to move 10 to the right as it is bigger than 3. and then you check with the next card to the left it is 7 which is bigger than 3. you move it to the right. similarly, you move 5, 4 to the right. And put the number 3 before 2 as 2 is smaller than 3. Code Insertion sort: Code is similar to the card and image above. It starts with the second element. Pick the second element to be inserted and then compare to the previous element. If the first one is bigger, move the first one to second position and second one at first. Now first and second item is sorted. Then, pick the third element and check whether the second element is bigger than the third. keep going similar way until you hit the first element or a element smaller than the element you are comparing with. When you get an item smaller than the picked item, you insert it. its a divide and conquer type algorithm. Code Merge Sort: Merge sort has two parts. Main part does divide or breaks down and second part is merging/combining parts. At the time of combining, parts are combined together. Divide: the first function named as mergeSort is actually a divide function. where an array is divided into two. Step-1: You have to pick a pivot. This could be randomly selected or the middle one. Here we select the last element of the array. 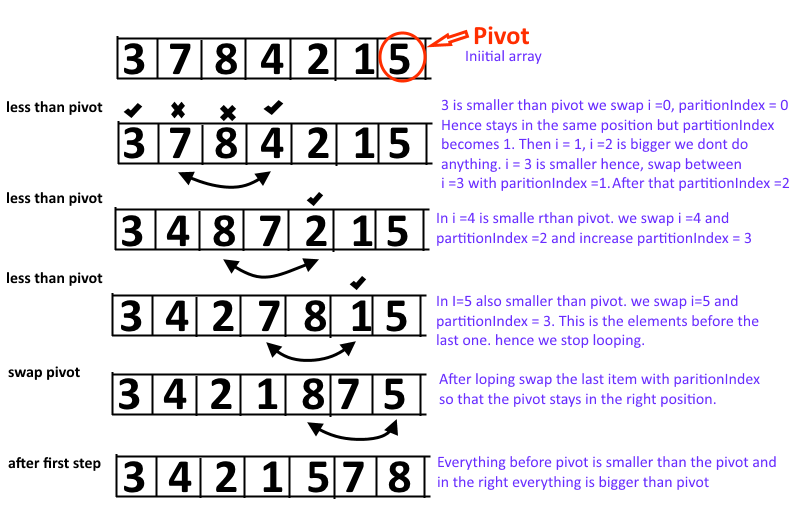 Step-2: Put all the items smaller than the pivot value to the left and larger than the pivot value to the right. Call Quick sort: Pass the array and pass left and right to the quickSort function. For the first call, left would be the index of the first element which is 0 and right would be the index of the last element which would be length -1. Select Pivot: We select pivot as the last index of the array. Call Partition function: After calculating the pivot, we send the pivot to the partition function. In the partition function we pass array, pivot index, left and right. partitionIndex: In the partition function, we keep move all the items smaller than the pivot value to the left and larger than pivot value to the right. We have to keep track of the position of the partition. so that we can split the array into two parts in the next step. This tracking of the index where we partition the array is done by using partitionIndex variable. the initial value is left. Swap function: This is just a helper function to swap values of the array. Repeat the process: Now come back to quickSort function. when you get the partitionIndex, apply quickSort for the left side of the array and right side of the array. keep doing it until left is smaller than right. how does it works: first step is to build an heap. That is done in the heapify function. Hepaify put the largest element at the root. Try to understand from here. It doesn't have any code. Question: Between merge and heap sort, which one you will choose? bucket sort or bin sort. you partition the whole array into small buckets. put numbers in the related bucket and then sort each bucket by another algorithm or using bucket sort. for example, you have an array where numbers between 1 to 100 is for a million times. If you want to sort it by any of the method we talked before, will be time consuming. shell sort is rarely used in application as it performs more operations and have higher cache miss ratio than quick sort. also known as count sort (not counting sort). you have an array. and each element has a key value pair. you iterate over the original array and put each element based on the key to its small array (pigeon hole). and then iterate over the pigeonhole array in order. 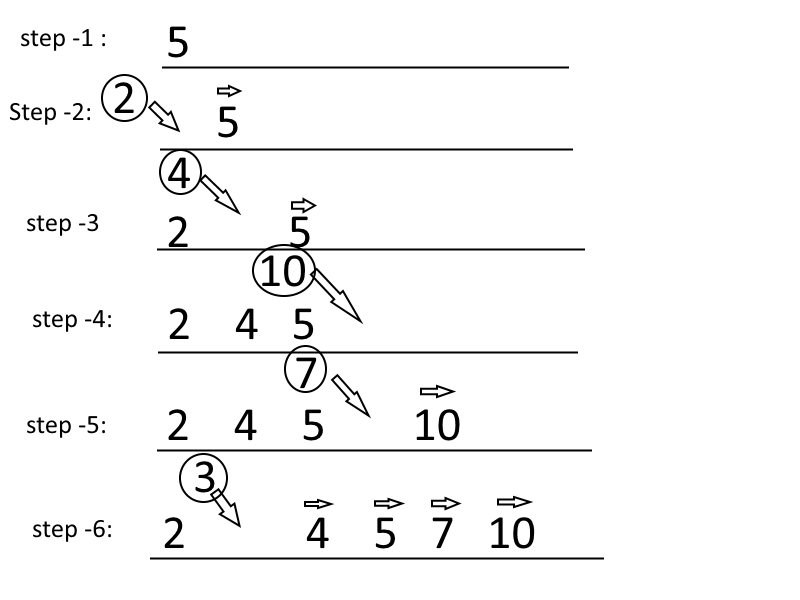 Counting sort: counting sort works same way, but it returns number of elements for each key other than the original elements. very thoughtful name, indeed. its a non comparative integer sorting algorithm. it compares the integer based on the position of the number (significance). also known as bidirectional bubble sort, cocktail shaker sort, shaker sort, ripple sort, shuffle sort, shuttle sort. difference with bubble sort is that this sort in both direction each pass. Its difficult to implement. Intro sort:combines both quick sort and heap sort. so that worst and average becomes O(nlongn). it starts with quick sort and switch to heap sort if recursion depth increases based on the number of elements to be sorted. Timsort: this is a hybrid of merge and insertion sort. try to find subset of data that is already sorted. and use that data to sort rest efficiently. and then merged by merge sort. this algorithm is primarily used in python. This actually invented by Tim peters to use in python.